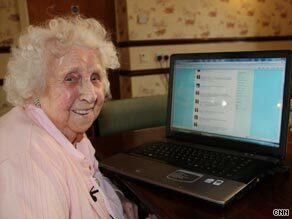 BRADFORD, England (CNN) -- Tuesday is her 104th birthday, but that hasn't stopped Britain's Ivy Bean from being an avid Twitter user and possibly the oldest person on the social networking site. Ivy Bean has 27,000 Twitter followers and tweets from the care home where she lives in Bradford, England. From the care home where she lives in the northern English city of Bradford, near Leeds, Bean updates her more than 27,000 Twitter followers about the ups and downs of her life -- from getting her hair done with her good friend Mabel, to eating fish and chips and watching her favorite game show, "Deal or No Deal," on TV. Last month, she tweeted her sadness that her friend Norma had passed away overnight. Before getting onto Twitter, Bean was already active on Facebook, where she maxed out her 5,000-friend limit in no time. Bean says she prefers Twitter because it's easier than Facebook -- it only requires updating. She has linked both accounts so that her tweets automatically show up on Facebook. Bean says she knows people must think it's amazing that she's so active on online, but she thinks it's a good way of keeping in touch with people. And for those who find it hard to jump on the Twitter bandwagon, Bean offers this advice: "Keep on at it." "Old" is not the first -- or second or even 10th -- word that comes to mind with Bean, an engaging, lively and friendly lady with a warm and infectious smile. Can the Twitterati help sell your soda pop? A resident of Hillside Manor, she recently won a gold medal at the residential home's Over-75 Olympics in the Frisbee-throwing category. And she enjoys bowling on the home's Nintendo Wii. No surprise, perhaps, for a lady who was a gymnast when she was younger. What do her friends think of her online popularity? "I think they might be jealous," she said with a joking laugh. Others at Hillside Manor also have Twitter accounts, but not Bean's friend, Mabel Davis, 87. "Just put me on yours, Ivy," she says. Already, Bean's centenarian tweeting and Facebooking have attracted international attention, and news outlets from around the world have interviewed her. Bean's daughter, Sandra Logan, 61, said she arrived for a visit one day only to find her mom busy with a call. "I'm on the phone with Israel," Bean called out to her daughter. Part of the reason Bean is so active online is because the care home makes activities for its residents a priority. One resident wanted to learn more about photography, so he now takes a course once a week at a local college. The home also helped another resident get a passport so he could visit his son in Spain. Hillside Manor also recently hosted a quiz with students from the local college. The subject was history. The Hillside Manor residents won. "We're trying to do something different than knitting or crochet," explained Pat Wright, the home's manager. Bean came from a large family with four brothers and three sisters. All are gone, Logan said. Bean, who was in the middle of her siblings, was approaching 40 when she got married during the "great war" to Harold Gibson Bean. He was a cook in the army, and she worked in a mill. After the war, the couple got a job "in service" to a wealthy family. Ivy Bean was a housekeeper and her husband was the cook and butler to Lord and Lady Guinness in Northamptonshire, England. Daughter Sandra, their only child, was born two years later, in 1947. The couple retired together but Harold Bean died a few years later, when he was in his 70s, Logan said. Bean now has three great-grandchildren with two more on the way, Logan said. They all call their famous great-grandmother "Little Nan." Wright says Bean is "very open" to new suggestions and new ideas and is always willing to have a go at something. "She must have been like that all her life," Wright says. "It's not a new thing. I think if you're one of those people that'll try anything through your life, it doesn't stop when you get old." As she types an update on her Twitter page, Bean certainly seems to be displaying an open mind. Would she agree? "I don't know if I have or not," Bean says. "But there's something there. There must be!" Is Ivy the oldest tweeter in town, or do you know an older twitterer? Use the Sound Off box to post your comments.